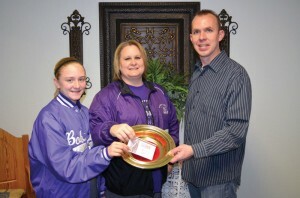 Tina Fontenot and her daughter, Tandy, left, place the envelope containing $150, which they found in a parking lot, in an offering plate as Hydro, First Pastor John Forsythe observes. HYDRO—With apologies to the ancient idiomatic phrase, “One man’s trash is another man’s treasure,” what many people considered trash was a gift returned to the Lord on Sun., March 10. In a series of events that could only have been orchestrated by God, an offering from an Hispanic congregation in Clinton—and destined to benefit a sister congregation in Oklahoma City—took a fateful four-day ride east, then back west, and finally east again along I-40. The players in the real-life screenplay included a state ethnic evangelism strategist, a small town pastor-turned-amateur sleuth, a Messenger reporter and the star of the show, an honest single mother struggling to care for three children. Jesus Pacheco, ethnic evangelism strategist with the Baptist General Convention of Oklahoma (BGCO), spoke during the Sunday School hour at Templo Bautista in Clinton. Afterwards, the congregation collected an offering amounting to $150 and put it in an old Edna McMillan State Missions Offering envelope and gave it to Pacheco to do with as he wished. They wrote his last name on the envelope. “I planned to give it to a struggling Hispanic church in Oklahoma City,” said Pacheco, named Hispanic Church Planting Missionary of the Year in 2007 by the North American Mission Board. Unfortunately, as Pacheco returned to Oklahoma City that day, he stopped to buy fuel at the Love’s Truck Stop at the Hinton exit on I-40, and the envelope fell out of his pocket. That afternoon around 2 p.m., Tina Fontenot, a member at Hydro, First, and her 16-year-old son, Terrin, arrive at Love’s in separate vehicles after picking up her 11-year-old daughter, Tandy, who had spent the night at Tina’s sister’s house. As Terrin fueled his vehicle, Tina went inside the travel plaza to pay for the gasoline. That’s when the “trashy” envelope, lying on the pavement, white side down and with tire tracks on it, came into play. “When I went into the store and then came back out, I stepped over it,” Tina recounted. “I went to open the car door to get back in, but then I thought for some reason that it was an odd-shaped envelope to be laying against the curb in the parking lot. Fontenot said she remembers picking the envelope up exactly at 2:10 p.m.
“I even looked at the time because I wondered how long it had been sitting here. It had been two hours since church let out, and it had been run over at least once. Tina said she thought maybe someone was trying to help another person who needed money. Tina called Keith Gillham, pastor of Hinton, First, and he said he hadn’t heard of the name Pacheco, either. Tina is employed as a Para-professional, working with special needs students at Hydro-Eakly Schools. She picks up a little extra money running the concessions at all athletic events. Finding $150 would have been a windfall for a single mother, but the thought of keeping the money never entered her mind. Tandy, a 5th grader obviously proud of her mother, reminded her of a family story; another instance of found money long ago. “You told me about when you were in college, you and dad found a wallet with a lot of money in it and you dropped it off at a police station and they came and got it,” she said as her mother smiled in affirmation. Tina took the envelope to church on Wednesday and showed it to Hydro, First Pastor John Forsythe, who recognized the Edna McMillan connection to the BGCO, and although he had never heard of Pacheco, either, he knew to call Kelly King, BGCO women’s missions and ministries specialist, who directs the SMO effort. King immediately knew who “Pacheco” was, since his office is next door to hers on the third floor of the Baptist Building in Oklahoma City. King alerted the Messenger office about the story, and this reporter had the privilege of traveling to Hydro on March 14 to get the details and retrieve the envelope to return it to a grateful Pacheco. “I’m so glad he got it back. It made me sick that someone lost it, and I’m just glad we found it,” Tina said. So, a Franklin, two Jacksons and a Hamilton, once lost, but redeemed, thanks to an honest mother and daughter, reached their destination safe and secure, even if it did take four days and an extra 240 miles on the odometer to do so.